By now, you're old enough to have mastered the feisty Mr. Coffee in your office kitchen and you might even know how to use a French press. But you're hiding a secret: you have no idea how to make iced coffee or a cold brew. Thankfully, you don't have to be ashamed any longer, because the HyperChiller Coffee Chiller is here to level up your coffee game by turning your hot coffee into perfect iced coffee in as little as a minute. Now, chilled coffee is not rocket science, but it's also not as simple as tossing in a few ice cubes. The HyperChiller streamlines the process by separating the coffee and ice to cool the coffee without diluting it with water. This incredible machine will chill your coffee by up to 130° in just sixty seconds. 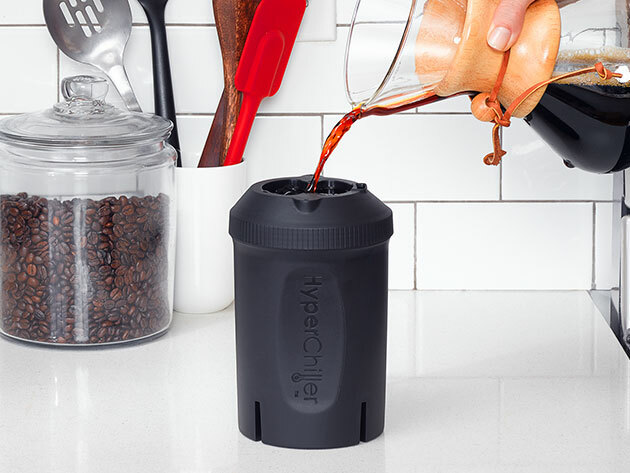 It's compatible with all brewing methods, so you'll be ready to bust out a cold brew in no time. It's even dishwasher safe, unlike that horrifying Mr. Coffee pitcher you haven't washed in weeks. The best part about this deal is that you get two Hyperchillers, so you can grab one to keep and give the other one to your coffee-obsessed friend, or leave one at home and keep one at work. Buy a set of two for the price of one for $45, which is a solid discount of 25% off the usual $60 price. You can also take an extra 15% off with coupon code: GIFTSHOP15.